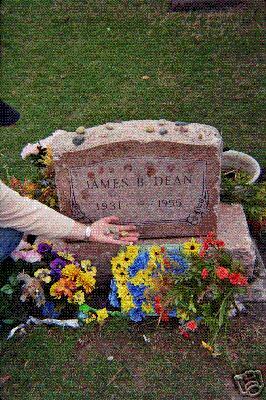 A James Dean fan recently put a stone up for sale on Ebay that they apparently collected from his gravesite. Of course the stones COULD have been scooped up from the ground next to his marker, so I'll give some benefit of the doubt here despite the fact that there's an awfully suspicious looking empty spot atop ole Jimmy, lol. The listing also noted that a different rock obtained from his grave by someone else, with dirt on it, had been appraised at $300 and another like it sold at auction for $180. This one must be clean because the asking price is a rock bottom (I had to) $4.99. No takers thusfar. For the record, taking stones from on TOP of a grave marker is the equivalent of pilfering flowers or other tokens left for the dead. Bad gravehunting etiquette. Those stones didn't get up there all by themselves. It's an age-old tradition attributed to the Jewish faith. P.S., it's intended to be a nice gesture. I'm always amazed and amused whenever I see people leaving "virtual stones" instead of "virtual flowers" on Findagrave.com memorials with negative comments like, "You were rotten and deserve nothing more than this rock!" Jean Harlow's evil stepfather, Marino Bello, has two, but at least one of the visitors gets it.